Cyclist Mark Cavendish has been named the Isle of Man's Sportsman of the Year for 2013. The 'Manx Missile' won a series of accolades in 2013 including the British men's road race title in front of 30,000 spectators in Glasgow. He also took his tally of Tour de France stage wins to 25 and won the points jersey at the Tour of Italy. "I owe so much to people on the Isle of Man and I love coming back. 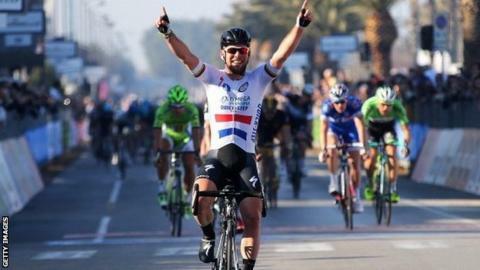 This award means a lot me," said Cavendish. "The Isle of Man is a phenomenal place with phenomenal people and I am proud to come from this island. I can't wait to represent them at the Commonwealth Games in Glasgow." Cavendish became only the fifth cyclist in history to win the points classification of the three grand tours in 2013 - the Tour de France , Giro d'Italia and Vuelta a Espana. The Omega Pharma-Quick Step cyclist added: "It was a super successful year. I won stages every month from March until October and want to build on that this year." Meanwhile, teenage eventer Yasmin Ingham was named the island's sportswoman of the year. The 16-year-old won double gold for Great Britain at the European Pony Championships in Italy in July. Together with her chestnut gelding, Craig Mor Tom, she also won the coveted Charles Owen British Pony Championship. She said her year "couldn't have gone any better". "It was fantastic and of course Tom made it possible. I never dreamt of being British and European champion in the same year. "This award is incredible," she added. The 2012 sportsman of the year, Peter Kennaugh, was named ambassador of the year. Kennaugh completed his first Tour de France in 2013, describing it as the pinnacle of his career. A special award was handed out to mountaineer who completed his "dream challenge" of scaling the highest peak on each of the world's continents. The Isle of Man Island Games team won the team of the year after they topped the medal table in Bermuda last summer. They claimed , including 36 golds, to top the medal table for the first time in 26 years. Elsewhere, enduro rider Jamie McCanney and cyclist Anna Christian won the under-21 awards for their achievements and long-distance walker Zoe Lambie was awarded the disability sportsperson of the year. Team Isle of Man cycling coach Mike Doyle was named coach of the year, Netball Association chairman Pip Cross best administrator and local badminton stalwarts Frank and Pat Anderson were recognised for lifetime achievement. IOM Sport vice-chairman, Gary Corkhill, said it was "arguably the hardest selections we have ever had to make with world, European and British champions to choose from". "We say it every year but last year was another great year for Manx sport," he added. Great Britain's double Olympic swimming champion was the guest of honour at this year's Isle of Man sports awards at the Villa Marina in Douglas.